I am a television producer. I work mainly in animation, making animated films and TV series for children and family audiences. I started my own company, after having worked for Channel 4 as a commissioning editor, and before that as a freelance producer and director. I love the people I work with, who are so creative and imaginative. I love the fact that it is different every day. And I love the fact that we are creating films that people will enjoy watching for years to come. 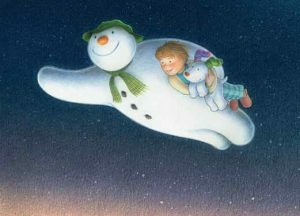 The Snowman is a timeless classic so it was fantastic to be able to work on The Snowman and the Snowdog – a film that beautifully captures the magic and excitement of the original film as well as being a heartwarming story about love, loss and friendship. It can be difficult because we generally work on big-budget productions using large teams and usually there is a tight deadline, which puts a lot of pressure on us to deliver on time and on budget. Diplomacy, tact, good people-management skills, a creative vision, the ability to stay calm under pressure, a good head for numbers, a passion for what you do and an ability to communicate your passion to others. Going to film school is a good start if you are passionate about working in film or TV production. It is also worth applying for work as a runner in a production company, as the best training is on the job, watching how things are done and learning from people around you. Camilla Deakin is co-producer of The Snowman and the Snowdog, and joint managing director of Lupus Films. The Snowman and the Snowdog is out on DVD and Blu-ray now. What is it like to be the Kung Fu Panda Director?